"Here in the Northwest many friends are a) vegan b) avoiding dairy c) lactose-intolerant or d) all of the above. 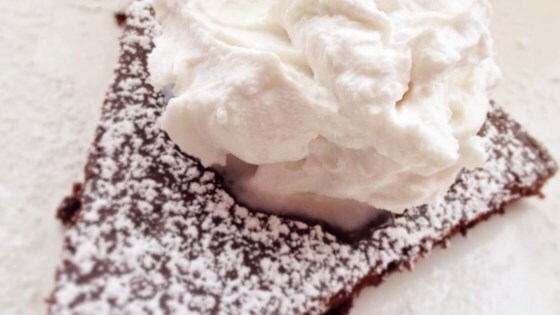 This recipe makes sure they don't miss out on one of the best parts of dessert: whipped cream! Keep a can or two of coconut milk in your fridge so that you're always ready to make this recipe! Variations on this basic version abound: add citrus zest, matcha (green tea) powder, cocoa, almond extract, pumpkin pie spice, mmm...! Plan ahead, because the coconut milk needs to chill overnight." Dairy-free whipped cream made with coconut milk. Do not use "lite" coconut milk - it won't whip. Organic coconut milk offers the best consistency. I have had the best success with Native Forest® or Whole Foods 365 Everyday Value® brands. If possible, avoid guar gum as an ingredient, which also inhibits whipping. The nutrition data for this recipe includes the full amount of the coconut milk. The actual amount of coconut milk consumed will vary. The remaining liquid can be used for smoothies. Perhaps my favorite frosting. Easy to make and a yummy coconut flavor.